The Jesuits desire to be a community of true disciples witnessing to the Risen Christ in our midst. Rooted in faith, guided by the Word of God to become signs of God's love and care for all creation. Our aim is to be prophetic, credible,relevant and a source of hope to our broken world. We long to be a Church as Family, a communion of communities, sensitive to the needs of our world, caring, sharing, supportive, with a preferential love for the poorest, living and proclaiming the Good News in the culture of our people. encouraging dialogue and reconciliation, respectful of the different charisma and gifts, nurturing integral growth, giving life in its fullness. The Parish Council is the main body in the parish that oversees all the activities under the parish. The parish council executive consists of eight people that include, the parish priest, the parish sister and lay people. The Church Council meet three times per year where each centre is represented by the chairperson, secretary and treasurer. Lay apostolic groups are also represented at these meetings. Due to the extensive area of Chikuni parish, it is divided into three zones i.e. Northern, Southern and Central zones. Each zone has seven centres as well as it's own sub-committee called a Church Council. 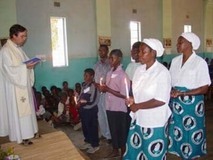 Church council meetings take place every month. There are many groups that parishioners can join within the parish. Some of these are below but there are many more. These are young boys who help the priest at the altar during the Sunday masses. They meet every Saturday at 14:00hrs for Sunday mass preparations and training for old and new members. These men and women teach catechism in the Parish. Young and old people are taught and directed in their catholic faith by these catechisers. The Catholic Teachers Association is a highly respected group who have completed many different workshops on topics such as spirituality, professionalism, social development and many others. They help in the improvement of leadership at all levels and they help young adults in serious decision making such as choosing their vocations. They visit and work in the hospitals during their free time as well as helping to reach out to the poorest amongst the community. They meet once in a month. This group of women promotes social work. They do various kinds of work at church, mainly making sure the church surroundings and linen are clean. They meet every Saturday at 09:00hrs to do their work. This Group helps create a greater awareness of God’s presence in people’s lives. It offers a way of life inspired by the spiritual exercises of St Ignatius of Loyola. In CLC, they aim to live lives inspired of Ignatian spirituality. Chikuni church boasts of a musical tradition that has been there since the coming of Christianity in 1905. They sing during Sunday masses at 09:30hrs and meet every Saturday at 14:00hrs for rehearsals. The English choir was introduced shortly after the Sunday English mass was created. This choir diversifies from the traditional Chitonga music to include music in English as well as other Zambian and African languages. They meet every Tuesday, Thursday and Saturday for rehearsals. This is a group of people that help in the development of the church. They help in the fundraising of finances at the church. The money raised from the fundraising is used for renovations and other needs at church. They meet once in a month. These are men and women who help in giving communion to the faithful during masses and services when priests are not around. They are chosen by the christian communities and trained. This is a group of young girls inspired by blessed Maria Gorretti’s life. They make masses colourful with their different dances. They meet every Saturday at 14:00hrs for prayer and rehearsals. Founded by Edel Quinn, this group of men and women meets every Wednesday at 14:00hrs to pray the Rosary and listen to the word of God. They also help bring back the lost, to Christ. This group started a long time ago although initially it was not been very active, but nowadays is one of the more active groups. They help at the church with any jobs that they can manage such as construction of buildings or renovations at the church. They also strengthen the faith of the young adults at the church. They meet in the second week of every month. This group does different works of charity in the parish. They also help strengthen marriages through counseling and leading by example through their own marriages. They meet every Saturday at 09:00hrs. 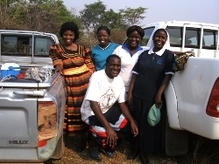 This group deals with unjust practices and helps to bring peace among Christians. All this is done in line with Christian norms. They meet every Saturday at 15:00hrs. This group teaches good morals in regard to taking psychotic substances. They lead by example by not taking alcohol themselves. They also meet to pray and listen to the word of God. These are men trained to lead the congregation in prayer on Sundays when priests are not available in that centre but saying masses in other centres. Founded by Blessed Frederick Ozanam, this group’s objective is to find those who are deprived and also bring the love of Jesus Christ to the suffering. They also spend time praying together. They meet every Sunday after the 09:30hrs mass. This is a vibrant group that takes part in different church activities. They meet every Saturday to do some work at church and charity work in the community. On Sunday afternoon, they meet to pray and listen to the word of God. They meet for music rehearsals on Wednesdays at 16:00hrs and have mass every Thursday at 17:00hrs. The sports fields are open all afternoons to promote virtues, discourage vices and keep them together.